This is another uplifting dance tune by a band with a name that is linked to my home land. Perhaps there is a trend to be started? Can anyone suggest some Belfast-centric named bands? I will put my mind to it. The track is a euphoric slice of summer and it sped my journey home this evening. I also love the fact it was released on Mushroom Pillow Records. I thought it was about time I posted a Disco classic. 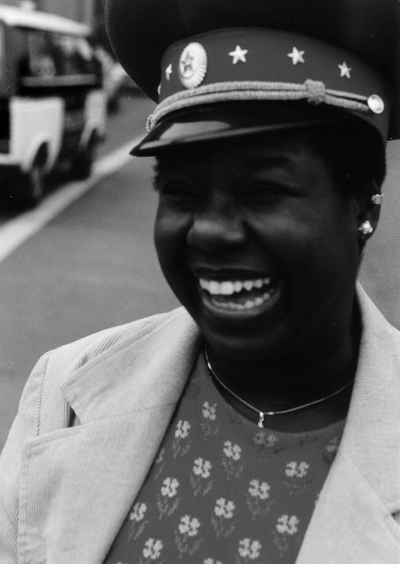 I love this, it is so smooth and funky and the vocal, courtesy of Disco-royalty Randy Crawford (see picture below, thank you Wikipedia), is truely amazing. I listen to this and wonder why people were so anti-disco back in 80’s. I can’t think of anything more fun that giving it stacks on a dancefloor to a tune like this. I have recently been a little fixated by Britpop and warmly reminiscing about the mid-90’s. As such, I have wanted to post this for a while. It features one of my all time favourite intros. Taken from the excellent Coming Up, which was released at Britpop’s zenith in 1996. Sorry I have been slack in posting over the past few days. It has been a hectic week. I was sorry to hear that Gil Scott-Heron had passed away last night. He was one of the pioneers of rap music, making socially conscious and challenging music. The revolution will not be televised made a big impression on me the first time I heard it as a very green teenager unaware of much outside my bucolic immediate surroundings. This, however, is my favourite track of his. It strikes the perfect chord between funky and profound. I needed somethign mellow this morning to soothe me after what has been a long week and I came to this. It is taken off the excellent, if bleak, album Figure 8. Elliot Smith was a talented but troubled guy. Posting Joy Division a few days ago made me think of him. I wanted to post something more modern today having gone quite retro recently. This is pretty fresh and I have been enjoying it over the past couple of days. I hope you do to. I would have happily posted the Donald Fagen song again from a few days ago as I have been unable to shake it. However, I met an old friend for dinner and he had come across a pristine original Atlantic 7” version of this track for me (thanks Davy). Pretty exciting! It is a classic soul tune – if I had to make only one CD to convince you of the merits of soul music this would definitely be there or thereabouts. I thought I would post a bit of further nostalgia today. Being at home always puts me in wistful form. It is nice to remember times gone by once in a while though. This is another favourite from the mythical mix tape which is a distillation of several long car journeys taken to the continent and back on childhood holidays. Donald Fagen was half of Steely Dan and this is the high point of his excellent 1982 debut solo offering The Nightfly.